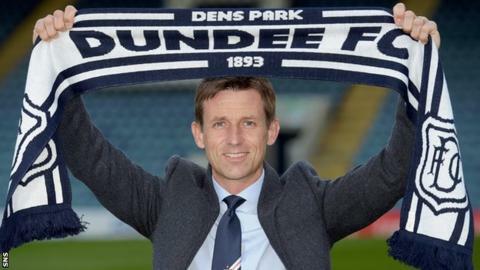 Dundee have appointed former player Neil McCann as their interim manager until the end of the season. The Dens Park club, second bottom in the Premiership, sacked Paul Hartley on Monday. The Dark Blues' next fixture is away to Motherwell, who are one place and two points above them, on 29 April. "Yes, we're in a poor position at the minute but, equally, we're not far off of [seventh-placed] Kilmarnock," said McCann, 42. "I'm excited. I appreciate the opportunity, I'm not going into anything lightly. "It's not a big risk for me, it's maybe a big risk for the club - a lot of guys will think because I've not been in a job before. "This opportunity was just too good to turn down." Dundee are on a run of seven straight defeats, with Hamilton Academical climbing above them after Saturday's 2-0 win at Dens Park. 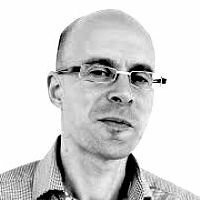 Scot McCann, who had a previous coaching spell at Dunfermline Athletic, has worked as a pundit covering Scottish football for Sky Sports. Managing director John Nelms said McCann was "first choice" for the job and the new manager insists the current Dundee squad is "absolutely good enough". "I am surprised at the position they're in," he said. "I'm not going to kid anyone on and say, 'it's just going to be easy' because it's not. There's a lot of hard work ahead. The other sides in and around us will have that same mentality. It's a massive job. "I think most people know the type of person I am, type of character, the standards that I liked to have when I was playing and training - those qualities I would like to think I'll bring to the football club. "It's my job now to sit with the players and try and get them to understand the requirements that's going to get them that extra yard or that extra wee bit that's going to be enough to see us win games of football." McCann also said he was "massively confident" of getting Dundee away from relegation trouble. He started his playing career as a winger at Dundee in 1992 and enjoyed stints at Hearts, Rangers, Southampton and Falkirk before ending his career at Dens Park in 2011. He also won 26 caps, scoring three international goals. And McCann's former Falkirk and Scotland team-mate Jackie McNamara has backed Dundee's appointment. "Neil has got great experience in the game," the former Dundee United and Partick Thistle boss told BBC Radio Scotland's Sportsound. "I don't think Neil would do this if he wasn't confident. The feelings he has for the club, the affinity he has with them, I don't think he would even consider it if he didn't feel he was confident of getting a reaction from the players inside the dressing room. "He's obviously an intelligent lad, he's got good ideas in the game. He's quite a fiery character, Neil. I always thought he'd go into management. "There's five massive games there for them to keep them in the division. They're capable of doing that."